You know smoking is bad. It's still the leading preventable cause of death in the United States. On average, smokers die 10 years earlier than nonsmokers. It’s hard to quit smoking, but you can do it. Don't you think it's time to put and end to it? Look inside a cigarette. 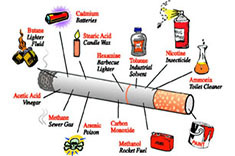 There are over 7,000 chemicals in tobacco smoke and about 70 of those chemicals are known to cause cancer. 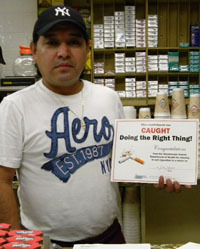 Each year tobacco use kills over 480,000 American smokers. Smoking causes lung cancer, cancers of the lip, throat, larynx, bladder, pancreas, stomach, kidney and cervix, heart disease and stroke, emphysema and chronic bronchitis. Many people think that e-cigarettes are safe alternatives to smoking regular cigarettes. They're not! Most e-cigarettes contain nicotine, which causes addiction. When youth smoke e-cigarettes it can harm brain function and lead to continued tobacco product use. Get the facts about the harmful effects of e-cigarettes. Don't go it alone. Quitting smoking is hard on your own. It often takes smokers many attempts before quitting. Maybe you have been thinking about quitting. Maybe you have already quit and have some helpful tips to share. Maybe you are trying to quit right now. Want help quitting? Go no further than your own backyard. NY State is doubling your chances of quitting by offering free Nicotine Replacement Patches. See if you are eligible for a free starter kit. Delay smoking when you get the urge. It will pass. Drink water, chew gum or have a healthy snack to fight cravings. Do something else to distract yourself. Take a walk, call a friend, keep your hands busy by doing chores or squeezing a rubber ball. Deep breathing will relax you. Close your eyes and take 10 slow deep breaths or meditate. Discuss your thoughts and feelings with someone close to you.